Under Mitt Romney’s tax proposal, no one making less than $200,000 a year is taxed on interest income, dividends or capital gains. For more on why this is just, see Parts One and Two, but to be brief, when investments are losing purchasing power at a faster pace than current returns, a tax on investment income merely acts as a second tax on top of inflation. In addition, under Romney’s plan, income tax rates are cut by 20% across the board, with the bottom tax bracket reduced from 10% to 8%, and the top bracket from 35% to 28%. The last President to lower top tax rates to 28% was Ronald Reagan, and we all know what happened back in the 1980’s. Romney’s game plan also eliminates the alternative minimum tax (AMT), which deserves to die, since Congress has failed to peg its exemptions to inflation. 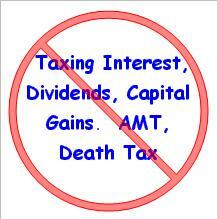 Aside from the above, Romney eliminates the death tax and caps corporate tax rates at 25%. Altogether Romney’s strategy is pro-growth, one fully capable of giving our stagnant economy the boost it needs to reach a full recovery, and place us back on the right track. Although Romney’s proposal isn’t perfect, it’s far better than the alternative, which can be pretty much summed up as nothing to less than nothing. That’s right! Barack Obama’s scheme omits economic growth as a viable possibility, instead settling on sanctimonious indignation against high achievers, especially business owners who would be hit by his proposed tax hikes. Obama’s blueprint offers nothing for 98% of Americans, those making less than $157,197 in 1993 dollars (the equivalent of $250,000 today). In other words, you won’t see your taxes rise or fall by one dime, except of course for those new health care taxes. And for the remaining 2%, those making more than $157,197 in 1993 dollars (the equivalent of $250,000 today), Obama offers to hike tax rates to 36% and 39.6%, and to raise the capital gains tax from 15% to 30% or more. In short, under Obama’s outline, 100% of the 51% of Americans who pay income taxes will either receive nothing, or less than nothing. But the most glaring flaw in Obama’s program is that it omits incentives capable of stimulating private sector investment, and thus growth. And without private sector growth, there will be even fewer jobs to go around, and only more of the same — temporary, deficit-financed, government boondoggles. Gross Private Domestic Investment is one of the four components of Gross Domestic Product (GDP). In the United States, real gross private domestic investment currently represents just 14.1% of real GDP, or $1.9 trillion. But after the Republican-led Congress passed a tax-relief and deficit-reduction bill in 1997, real gross private domestic investment subsequently peaked at 17.5% of GDP in the year 2000. The 1997 bill lowered the capital gains tax from 28% to 20%, which induced greater levels of private domestic investment, leading to a higher rate of GDP growth, and increases in economic activity, employment and tax collections. Contrary to popular opinion, it was actually the 1997 tax cuts, not the 1993 Clinton tax hike, which produced the boom of the 1990’s (see chart below). 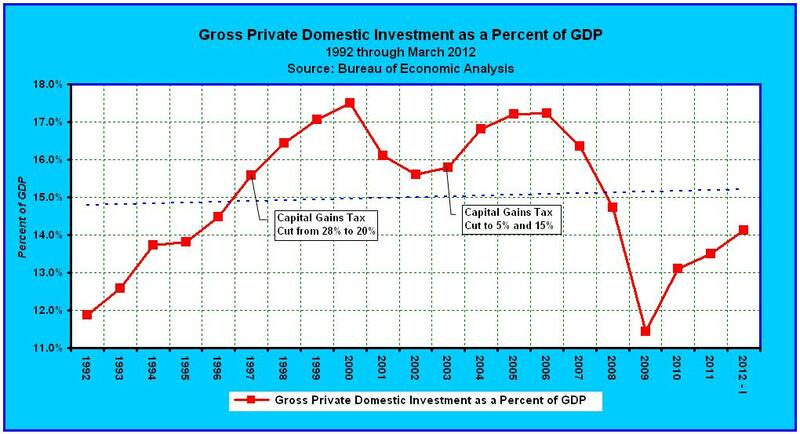 In the year 2000, the Dot-Com Bubble burst, wiping out a great deal of private capital and reducing gross private domestic investment back to 15.6% of GDP by 2002. So Republicans passed the Jobs and Growth Tax Relief Reconciliation Act of 2003. The 2003 Act slashed capital gains rates once again, this time to 5% and 15%. This attracted capital investment back into the economy, boosting gross private domestic investment to 17.2% of GDP in the years 2005 through 2006. Then in 2007, global credit markets went haywire, the housing bubble burst, and the Great Recession commenced. Lasting until June of 2009, the most recent downturn dragged gross private domestic investment to a 20-year low of 11.4% of GDP. Although there has since been a mild rebound to 14.1% of GDP, gross private domestic investment remains hopelessly mired in the same doldrums faced in the mid-1990s. Private investors, perhaps with good reason, are still reluctant to place new capital at risk domestically. There is a strong correlation between gross private domestic investment and real GDP growth (see table). Which came first, the investment or the growth? Well, without investment, there is no growth. And investment can only come from two sectors, private or government. Federal government consumption has remained constant, representing 7.7% of GDP in 1995 and 7.6% currently, while state and local government consumption has declined from 13% of GDP in 1995 to 10.6% currently (see table). The federal goverment’s contribution to GDP is already deficit financed, and state and local governments have bankrupted themselves through commitments to union induced pension schemes and Medicaid. So which is likely to succeed, more deficit-financed government investment, or higher levels of private sector investment? The reason gross private domestic investment remains retarded is due to the policies of Barack Obama. Under Obama’s program, government spending has spiraled completely out of control, resulting in a glut of low interest U.S. Treasury securities, which are siphoning off capital from the private sector, via the lure of a government guarantee. This is doing a great deal of harm to the American economy, since government is incapable of building anything on its own. As a matter of fact, the only accoutrement the federal government has built by its lonesome is a $15.8 trillion mountain of debt, which now amounts to $139,500 for each U.S. taxpayer (subject to increase every millisecond). What’s ironic is that a taxpayer investing in U.S. government securities is also responsible for making interest payments on the same, through income taxes. After all, it’s not like the government has its own private stash with which to pay. Thus, the notion of government investment is but a farce. The Obama administration’s latest presumption involves purchasing aviation biofuel through the U.S. Air Force at $59 per gallon, while straight avgas is selling for $3.60 a gallon. This they surmise is somehow a good use of taxpayer monies. The Obama administration, in its wisdom, fully expects the price of biofuels to fall by 2015, even if solely through the demand of a single customer – the U.S. taxpayer. Apparently, no private sector airline is dumb enough to join the gala. The major flaw in this design is that the recipient of this generous subsidy, Gevo, Inc., relies heavily on corn in the manufacture of its patented isobutanol fuel. And since day corn prices have jumped by more than 52% in the last month, due to the severe drought, this puppy is liable to go bankrupt by the end of the year, along with the rest of the Obama administration’s not-so-green, government financed, ventures. But at least we can say, “We didn’t build that, somebody else made that happen.” Is converting the food supply into fuel ever a good idea? Hello! By the way, Gevo’s stock peaked on the NASDAQ exchange at $25.55 per share in April of 2011, but since the end of June has been trading below $5.00 per share. The fact that the stock had already lost over 80% of its value before the drought tells us all we need to know about the current administration’s due diligence. Relying on government investment to make up for a shortfall in private investment is kind of like cutting off your nose to spite your face. Barack Obama’s parting shot, proposing to raise income taxes in the middle of an economic quandary, is about twice as dopey. By now it should be clear that Obama’s big-government dream isn’t the solution to our problems, it is the problem. Government doesn’t know best. In fact, but for the $2.4 trillion a year it collects in taxes from the private sector, the federal government wouldn’t exist. Raising real gross private domestic investment back to 17.5% of GDP would add as much as 3.4% to real GDP, or the equivalent of $455.6 billion. And since according to the Bureau of Economic Analysis, per capita personal income is currently $37,500, that means rebalancing the economy in favor of gross private domestic investment could translate into as many as 12.2 million new jobs. Mitt Romney’s proposal, to eliminate the tax on interest, dividends, and capital gains for those making less than $200,000, is the only serious plan on the table capable of boosting gross private domestic investment back to 2000 levels, and beyond. And the creation of 12.2 million new jobs through Romney’s strategy is just the tip of the iceberg. Additional jobs are created through increases in personal consumption as the result of cutting income tax rates by 20% across the board, eliminating the AMT, eliminating the death tax, and capping corporate taxes at 25%. In contrast, Barack Obama’s inflation tax raises taxes on the most productive Americans, those making more than $157,197 in 1993 dollars (the equivalent of $250,000 today), and does nothing for the other 98% of Americans, the combination of which will result in the loss of as many as 12.7 million jobs. So Obama’s notion offers nothing to less than nothing in terms of economic growth. Mitt Romney’s proposal, on the other hand, leads to higher levels of gross private domestic investment, GDP, economic activity, employment, and tax collections. It’s the best hope for improving America’s economic condition. It’s economic independence versus dependence. It’s faith versus hopelessness. It’s pro-growth versus nothing. Thus, you may place me in the decided column. Was there ever a doubt? Democrats Want to Abolish I.C.E.